These Victoria Falls safari and vacation packages present you with the opportunity to experience all that The Falls have become famous for, whilst staying at selected Victoria Falls safari lodges and hotels. Experience Victoria Falls. Witness the dramatic transformation of the broad, placid, slow-moving Zambezi River into a raging, angry torrent that crashes into a foaming chasm before racing through gorges carved deep below the surrounding countryside. Just being here to see and hear the heart of thunder of this breathtaking phenomenon, is all that a trip to Victoria Falls is really about. The best time to visit Victoria Falls is during the high water season from January to early May, when the Zambezi River is at full flow. For the average holiday traveler, Victoria Falls provides an absolutely awesome experience, whilst for the adventure-seeker, this is the best time for white water rafting on the Zambezi. A variety of superb Victoria Falls accommodation options are available, including safari lodges, hotels, river resorts and bush camps in Zambia and Zimbabwe. These are situated in close proximity to Victoria Falls and Livingstone. Besides the exciting adventure activities, canoe safaris and elephant-back safaris, this is the ideal destination to serve as the starting point for your safari into Africa. There is a variety of canoeing safaris available both above the Falls, and in the game-rich area of the Lower Zambezi Valley. Drift slowly past elephant or buffalo drinking at the river's edge, and watch crocodiles on the riverbanks. Adrenaline junkies of the world unite! Enjoy exhilarating Adventure Tours at Victoria Falls where you can include bungy jumping, kayaking, white water rafting, abseiling, river boarding, jet boating and helicopter flips to your "To-Do" List - here in Africa's adventure capital! Zimbabwe's flagship national park is Hwange, renowned for its large populations of Elephant and Buffalo. Chizarira is a remote reserve where you can experience the untamed nature of the bush on a walking safari. The nearby Matetsi Game Reserve is well worth a visit to see its population of rare Sable antelope. The more adventurous can participate in elephant-back safaris.Otherwise, game drives, sunset river cruises, and walking with Lions or the various Zambezi trail walks and cultural tours are for the more laid back visito. Or just go fishing. There are several unusual places to eat out at on both sides of the river. Almost every hotel has a good restaurant, and some places come with an added experience such as drumming or traditional dancing performances. Sharing the Seventh Wonder of the World, Zambia and Zimbabwe meet along the mighty Zambezi River. The mile wide Victoria Falls and Batoka Gorge form an awesome focal point. The centre of this railway suspension bridge is 'no-mans land', and the site of magnificent views of the falls and gorge, from where Bungy jumpers launch themselves into the gorge. The historic town of Livingstone, Zambia and the bustling town of Victoria Falls, Zimbabwe are connected by a 30 minute road transfer over this famous bridge. Better still - aerial flights by chopper or light aircraft can be arranged in both towns, for unforgettable views and photo opportunities over the Falls. Marimba street musicians at Victoria falls Village. Get about and meet the locals. Wonderful craft markets, colorful cuisine and friendly people and a chequered history. All our Victoria Falls packages are inclusive of return flights from Johannesburg. 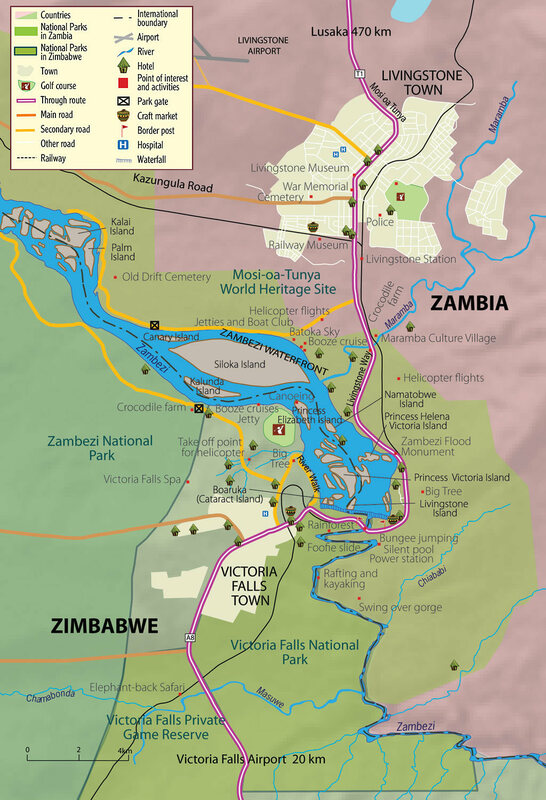 However, read this if you are planning on getting to Victoria Falls by road, on your own.